Something occurred to me before my first cup of coffee this AM- maybe Larry Moss wasn't a good guy after all. And maybe Tony Almeida was one of the only guys to know this fact. Yeah, I know, I'm trying too hard to come up with an excuse for Tony. Anyway, it's been this blog's tradition to honor heroic bureaucrats with a US Postage stamp. 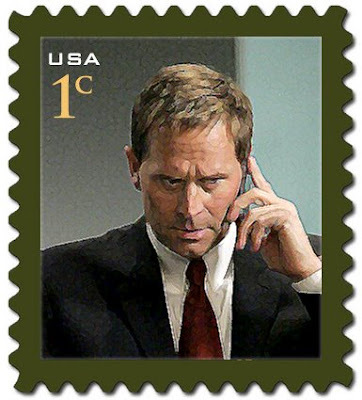 So, barring any post-mortem revelation that Larry was a bad guy, our Special Agent still only rates for a penny stamp. George Mason and Bill Buchanan were vikings- they died as warriors. Moss died while wearing a friendship bracelet from Renee. A penny stamp is used to help a real stamp get things done. You'd never use a penny stamp on its own, it's completely ineffectual. You see where I'm going with this? At the start of this season, I didn't think I'd give Moss any kind of recognition. The paper-pushing Mirandizer grew on me pretty quickly. Adios, compadre. And AmyV, I'm not ready to quit "24" yet. I came back after Season 6, right? That was brutal. I'm going to let things play out. I've got a headache today and I think it's because of last night's episode. And even though the end was shocking, I thought it still was an excellent episode. Nooo! Not Larry :( I thought he was a gonna.. but maybe he's the real zombie. Yea, it's time to just let this one play out. 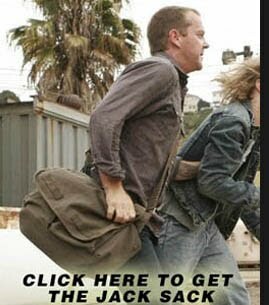 Rickey long ago realized that everything on 24 happens for a reason. If they turned Tony into a bad guy, it's so he can kill off Kim whose dying wish will be to give Jack her stem cells to cure his mystery ailment. Bank it! @JAB & Justin- I agree completely- let's wait. @Squish- Let's hope Zombie Larry is less uptight. @Rickey- You wanna get tacos or something this week? Let me know. So, Jack takes Elisha Cuthbert's "second-hand" stem cells? Please, no Sean Avery jokes. Indeed. Rickey's hungry. Let's go get a taco. (ironically, the movie you're referring to shares it's name with Rickey's company softball team). I never really had much of a problem with Larry. At least (I thought) he was well played, kind of like how you feel aboout Charles Logan, and even in the earlier bits of the season, I could tell that he was just an immature kid that's trying to do the right thing. He could've grown and perhaps have Tony Almeida potential(Remember how Tony was in Season 1? ), and he barely lasted 75% of a season. Cut the guy some slack. If any character deserves a penny stamp, it's Curtis. He lived through two seasons, and he was so far from an actual character that he might as well have been replaced by a robot.